Chatham Maritime Marina: Situated on the River Medway in Kent, Chatham Maritime Marina is at the heart of a multi-million pound leisure and retail development that’s set to become a major waterfront attraction. Following a recent expansion, the marina now has 412 berths and is close to a factory outlet shopping complex. 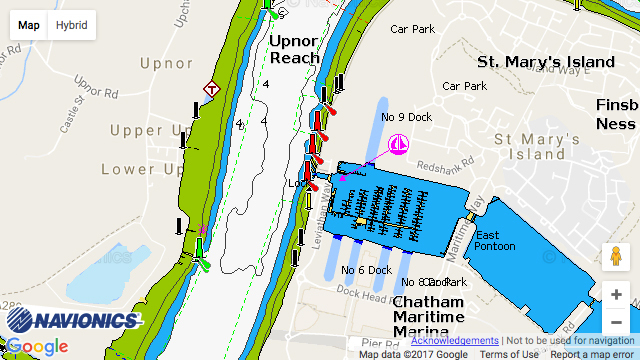 Chatham Maritime Marina is part of MDL Marinas, Europe’s leading marina operator, who are proud to offer the most comprehensive berthing package in the marketplace. The Freedom Berthing package gives owners far more than a superb berth and marina facilities, it’s a passport to extra rewards, benefits and savings, such as complimentary stays at over 100 marinas both in the UK and Europe, discounts on boatyard services, super fast WiFi and fuel at cost.